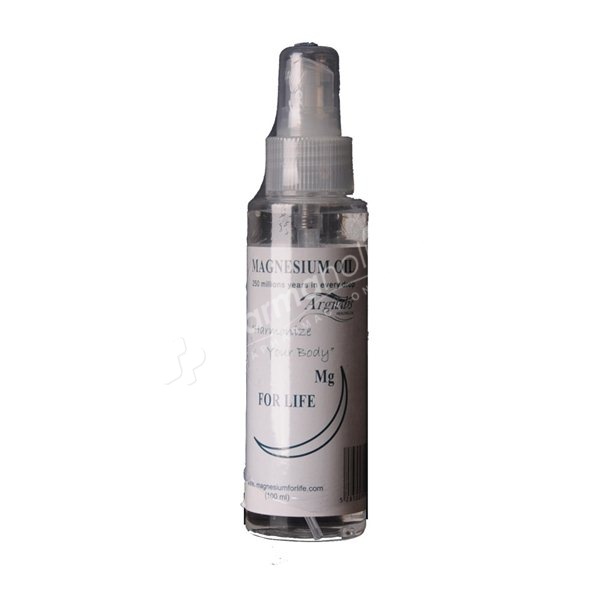 Magnesium Oil Spray to help relieve the symptoms of Insomnia, Restless Leg Syndrom, Night Cramps, Stress and Travel Fatigue, Reduces muscle spasms cramping and relaxes tired bodies. Magnesium oil boosts almost all aspects of cell physiology. Magnesium chloride transdermal treatments address systemic nutritional deficiencies, act to improve function of cells and immune system , protect cells from oxidative damage. It is a systemic medecine as well as a local one bringing new life and energy to the cells wherever it is applied topically. Magnesium oil boosts body processes, reduce risk of certain cancers, strengthen muscles and tissues, and help develop organs and tissues and help protect them from deteriorating. 15 sprays on body twice daily or as by physician or foot soak in 50 ml with warm water for 20-25 minutes. Magnesium chloride hexayhdrate 33%, Purified water.